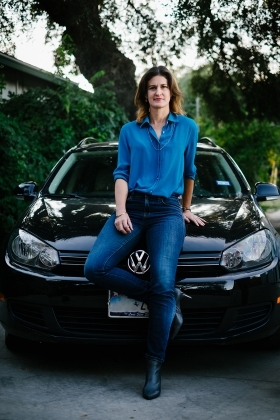 Sarah Finley, who traded in her 2003 VW Beetle for a "clean-diesel" 2010 Jetta, says her praise of her car directly influenced two of her friends, a couple, to buy Jetta and Golf SportWagen TDI models -- the Golf was bought a week before the scandal went public. Edward Boches, an advertising professor at Boston University, recalls a famous VW print ad from 1963 titled "How to do a Volkswagen ad," a storied piece of brand lore now hovering over a controversy that contradicts everything the brand once stood for. 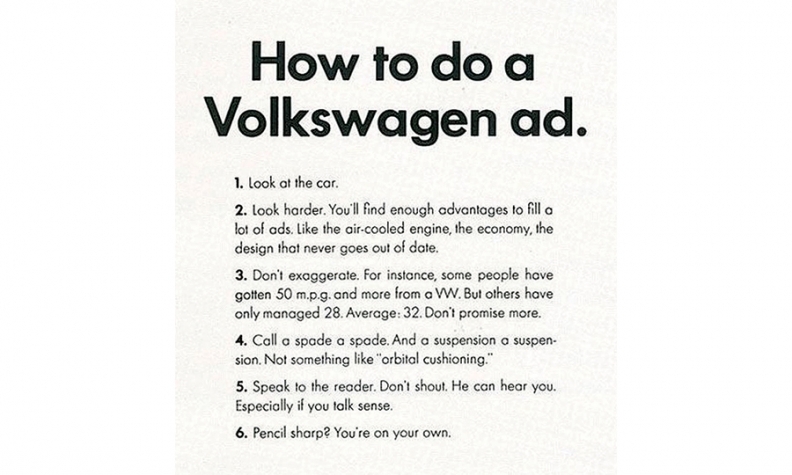 In plain black text -- a hallmark of the forthright VW creative style of that era -- the ad listed six putative guidelines for creatives to follow. Among them, ironically, was this admonition: "Don't exaggerate." "It was the epitome of honesty in advertising," said Boches, who has held several posts at ad agency Mullen, including chief creative officer. With the latest scandal, "not only did VW betray its customers, dealers, suppliers and employees," he said, "they betrayed their own history." Even for owners who weren't alive in 1963, the disclosure of a seven-year deception by VW was a black eye, especially given the tenor of recent ads that supposedly sought to set the record straight on the benefits of "clean diesel," and the fact that many customers themselves served as pitchmen for the technology. Sarah Finley, who traded in her 2003 VW Beetle for a "clean-diesel" 2010 Jetta, says her praise of her car directly influenced two of her friends, a couple, to buy Jetta and Golf SportWagen TDI models -- the Golf was bought a week before the scandal went public. Two other friends who were considering TDIs sought out her opinion. "I feel guilty about pressuring my friends into buying this 'environmentally responsible' car that turned out not" to be, said Finley, 43, of Austin, Texas. Andrew Choi gave up a 2015 Golf Mk7 GTI just a few months ago for a 2015 Golf SportWagen TDI, because of the promise of better fuel economy and insurance costs. Now he wants VW to give him his old model back in an even trade. "I don't want to sound like I'm having a tantrum, but if I can't get my way in something here, then I'm probably going to think about BMW or going back to one of the Japanese brands," said Choi, 27. Younger customers such as Finley and Choi represent a particular marketing challenge for VW as it tries to rebuild its reputation. While some VW enthusiasts may be quick to forgive the brand, others might feel especially annoyed that they were duped -- and not just let down -- by a brand they trusted. Unless VW comes through with a fix that pleases everyone -- one that deletes the software designed to cheat on emissions tests without compromising fuel economy or performance -- the brand stands to lose an army of goodwill ambassadors such as Finley. TDI buyers are "a very enthusiastic lot, big advocates for the brand and technology," wrote AutoTrader analyst Michelle Krebs, in an email. "I can't get into their heads, but I suspect they feel particularly betrayed. It depends what VW does and how quickly, but it seems like it will be hard to win them back." After the scandal erupted, Volkswagen marketing chief Vinay Shahani told dealers that the company would "temporarily pause a majority" of its national "Tier 1" media through Oct. 11, including nondiesel ads. According to Boches, VW can take several courses of action to keep these owners in the fold, or at least keep them from becoming public critics, including social media outreach, open letters in major print outlets and apology notes to owners. Boches says he'd avoid making a splash with a huge apology campaign. Instead, he would recommend doing a little at a time, and observing how people respond. For starters, he'd send an apology letter to every current and past VW owner on whom the company has information. TDI owners, Boches says, would get a different letter illustrating that VW is taking action and willing to earn back their trust. In addition, Boches said he would run one or two open letter ads in publications such as The New York Times or The Wall Street Journal. Boches said he would turn to bloggers and other influencers, who have their own trusted communities, to help spread stories highlighting how VW regrets what took place. The key for VW, Boches says, is to take responsibility without beating itself up too much. "I don't know if they want to make a huge deal out of it. In the age of nonstop content, it's possible that in a year -- [maybe] even less -- there are some people who are not paying attention to this who are prospective VW buyers," Boches said. "The trick is saying the right thing to the people who are pissed off, but not overly calling attention to it."